Global Protect Switcher lets you save and switch between Global Protect Profiles with the Palo Alto Networks Global Protect VPN Client. 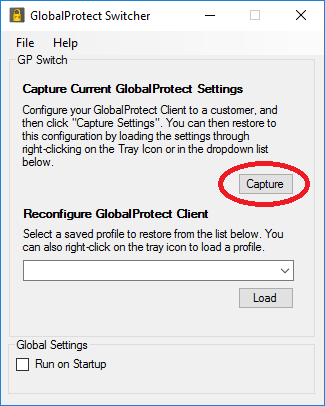 Global Protect Switcher is a utility the permits you to save and switch between profiles for the Palo Alto Networks Global Protect VPN Client. If you find yourself hopping between multiple Global Protect portals on a regular basis, then this tool is an absolute lifesaver – and will save you a lot of time. So, if you work in a managed service provider, a value-added reseller, or just need a quick and easy way to change Global Protect portals, this is the utility for you. 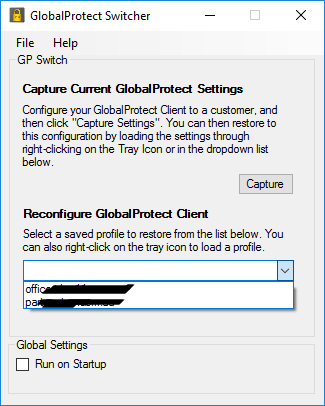 Global Protect Switcher has been tested on all 2.x and 3.x versions of the Global Protect client. It only works on Windows 7 or newer, and there is no support for Windows XP or Mac OS. Global Protect Switcher will also automatically convert PEM files to PPK files. Handy for those of you using Amazon Web Services (AWS) on a Windows machine with PuTTY.